Beelink MINI MX Amlogic S905 Android media player has similar features, and costs about the same as K1 Plus TV box I reviewed last week, so it would be interesting to compare both. While specifications are similar there are some differences. For example, MINI MX lacks AV output, and only features two USB ports against four for K1 Plus, but it supports Gigabit Ethernet which could be an advantage while playing high bitrate 4K videos, as well a Bluetooth 4.0. I’ve already provided pictures and torn down MINI MX, so today is time for the full review and a comparison with K1 plus. I connected my USB 3.0 hard drive to one of the USB port, and a USB hub to tghe other port with a USB webcam, a USB keyboard, and two RF dongles for a gamepad and an air mouse. I also inserted the usual HDMI, optical audio and Ethernet cables, and connected the 5V/3A power supply. The boot usually takes a little over 50 seconds, only a little slower than K1 Plus (48 seconds). 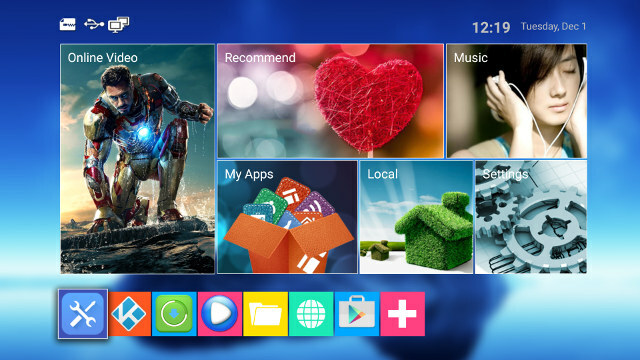 I think I’ve seen this launcher before, although don’t quite remember on which device exactly. It includes 6 large icons, with 4 of those (Online Video, Recommend, Music, and Local) being some folders for apps, and My Apps providing access to all installed app, and Settings to the usual Amlogic settings app. There are also customizable shortcuts on the bottom of the screen, and status icons and date & time on the top. 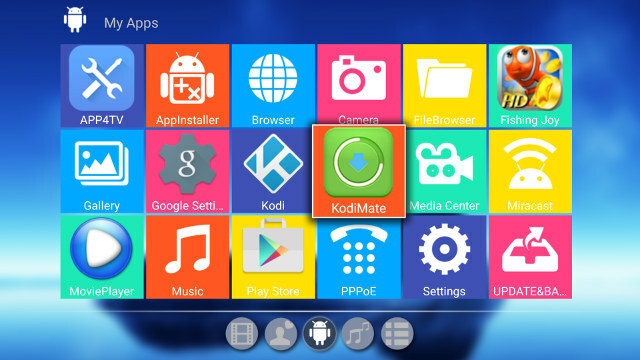 The list of pre-installed app is pretty standard, except APP4TV app linking to some streaming apps like Netflix or Hulu, and KodiMate which will install some add-ons for Kodi. More on this latter. Preferences – HDMI CEC (But not working: “This remote device does not support CEC”), and Play back settings with “HDMI self-adaption” On/Off. WiFi, Ethernet and Bluetooth all worked OK, and I could set video output to 4k2k 60Hz. However, the same problem (as in K1 Plus) occur, with the video output sometimes falling back to 1080p50. 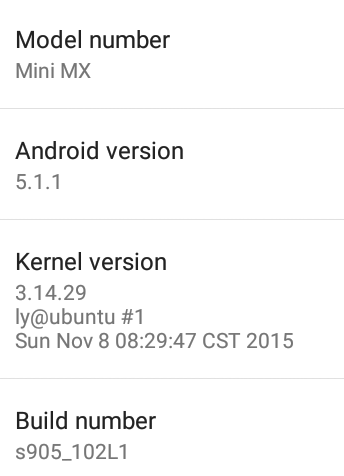 Going int to “About Mediabox” section shows MINI MX “model number” running Android 5.1.1 on top of Linux kernel 3.14.29, and the firmware build was s905_102L1. 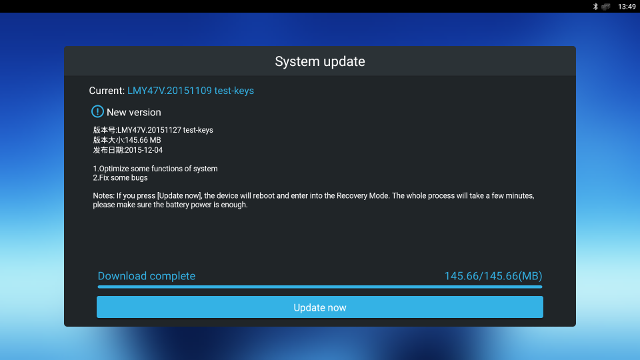 You can also go to a System update menu in this section, and the good news is that it’s working, and I got the firmware updated to s905_103L1, while NOT getting my data and apps wiped out. But unfortunately it was only released after I finished testing, so I did not test Dec 4 firmware in details. Nevertheless that’s a big plus against K1 Plus here. The firmware is also rooted by default. I could use the provided infrared remote control up to 10 meters, but it’s quite directional, so you have to make sure you point it to the device, especially once you start getting over 5 meters away. There’s no IR learning function in this remote, and HDMI-CEC is not working either. I did not use the remote control very long, and fully switch to MeLE F10 Deluxe for the rest of the review, especially since the status bar can be shown and hidden easily. I could install most apps required for the review from the Google Play Store, except Antutu Video Tester, which I normally side-load anyway. Applications that require telephony / SMS, GPS or limited to specific country can’t be installed, and that’s fine. I also installed Riptide GP2 from Amazon Underground since I got it for free over there. If you want to see some details about the settings I did not cover here, you can watch the user interface walk-though video. The device can be cleanly powered on and off with the remote control. Standby mode is not implemented, which mean you’ll need to wait 50 seconds or so each time you boot the device. There’s no power button on the unit. MINI MX seems to consume a little less than K1 Plus in power off mode (1.3W), and much lower in idle mode, where I could not K41 Plus to get below 6 Watts in idle mode. It’s not perfect though, as there’s still some residual power used in power off mode, and the best device will just show 0 or 0.1 Watt while powered off. Beelink MINI MX stays quite cool, as I measured 39°C and 44°C on the top and bottom of the case after running Antutu 5.7.1, and after playing Riptide GP2 for about 15 minutes (although not with maxed out graphics settings), the maximum temperature went up a little to 45°C and 48°C. The firmware is stable, but feels sluggish at times, where I may have to wait 1, 2 or 3 seconds before I can move the mouse pointer, and it miay take 5 to 8 seconds to go back the launcher after exiting an application. Kodi 15.2 is pre-installed in the device without add-ons, and this time I had no problem with an incorrect resolution being reported, even when settings the resolution to 4K 60 Hz. As mentioned before I noticed an app called KodiMate in the firmware, so I started it. 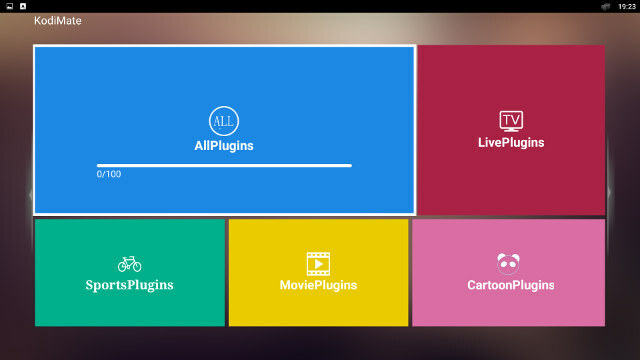 Lots of plugins for Kodi apparently. So I clicked on AllPlugins and it downloaded some files, and installed Kodi add-ons, including the infamous Navi-X or 1 Channel add-ons, which are banned on Kodi forums. I guess they’ve done that to avoid getting caught at the customs, as the box is shipped without any piracy add-ons, but the user can easily install them at home. 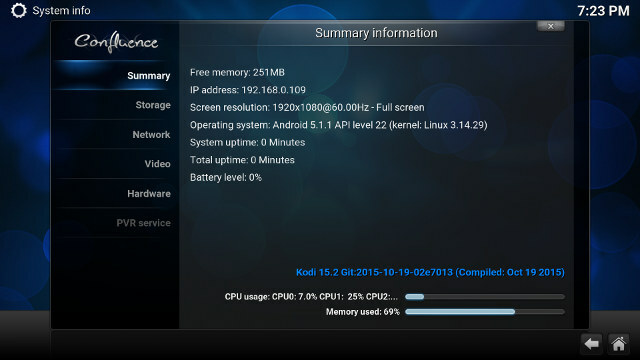 One Kodi developer informed me that Kodi was not ready for Amlogic S905, but I still gave it a try in case Netxeon or their partners worked on Kodi. Unless otherwise noted, all videos are played over Ethernet from a SAMBA share. I started with Linaro media samples, Elecard H.265 samples, and low resolution VP9 video, and I was pleasantly surprised not to get the letterbox issues as in K1 Plus. Not too bad actually, although H.265 hardware decode does not seem implemented. But then I tested with audio video samples in Kodi, and MX Player, and things started to get bad in Kodi for some reasons, and DTS and Dolby are not supported by the system, except if you use audio pass-through. I wanted to show it in video, but I shot the video about an upgrade to 103L1 firmware which also includes Kodi 16.0 Beta. The artifacts are gone, but Kodi is crashed/exited for both videos. BT.2020.20140602.ts (Rec.2020 compliant video) – OK from USB HDD, but stopping after a short while while playing from network. Fifa_WorldCup2014_Uruguay-Colombia_4K-x265.mp4 (4K, H.265, 60 fps) – OK, but no audio. Astra-11479_V_22000-Canal+ UHD Demo 42.6 Mbps bitrate.ts (10-bit H.265 from DVB-S2 stream) – Plays fine most of the time OK, but it will freeze and the same exact point every time for several seconds. (tested on USB drive only). 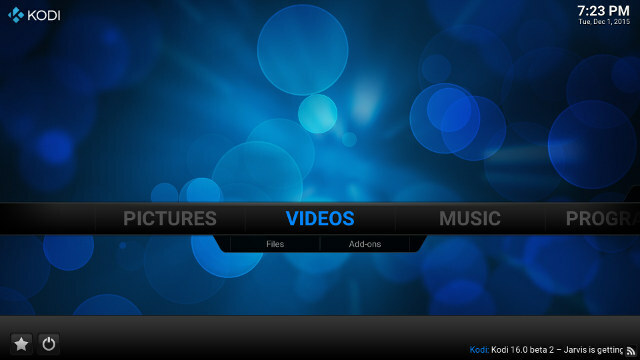 The results are very similar between Video Player – as tested with K1 Plus -, and MX player. I’m a little disappointed that the Gigabit Ethernet connection does not improve playback from the SAMBA share, so there must be a another bottleneck. The last one is interesting… That 120 Mbps video is the video with the higher rate in my video test files, but the network can cope fine, although video decoding not being optimal. The videos is a 1080p H.264 video at 24 fps without audio. 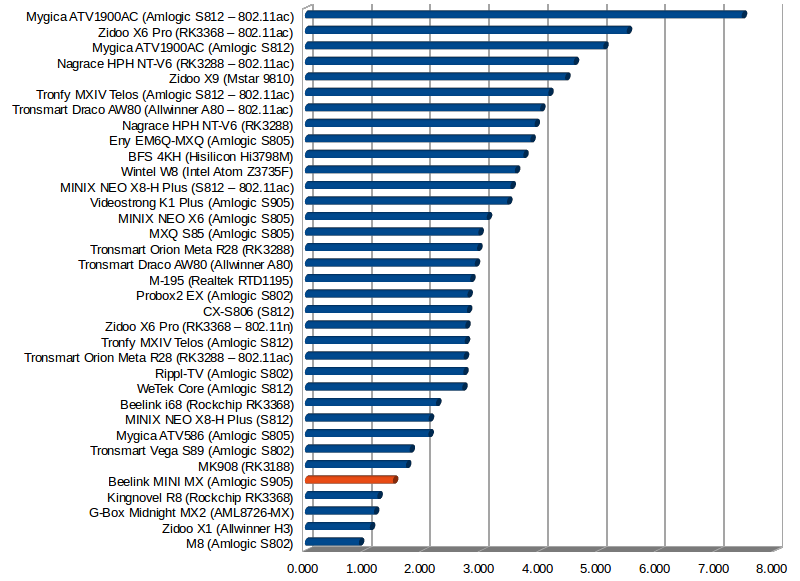 I’ve also tested some longer movies, or video clips, and MX Player does not support IFO files, but I had no troubles with VOB, MKV, AVI, MP4 and MKV video, except for the lack of DTS/Dolby support with PCM output, as I did not get audio at all when these codecs were used. Previously I also tested a 2-hour video in Kodi 15.2, and it plays all the way without issues, except that there was some stutter when the camera was panning, probably due to the lack of automatic frame rate switching support. MINI MX got 891 points in Antutu Video Tester 3.0, or a little lower than the 906 point in KI Plus, but still without many unsupported videos. 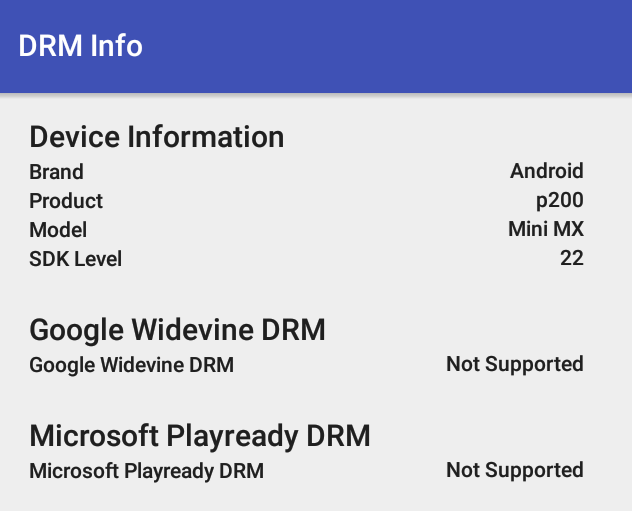 I’ve also included the result from DRM Info, which shows Widewine nor PlayReady are installed, and the former may be any issue for some video streaming apps such as Netflix. If you want the video samples used in my reviews, please visit “Where to get video, audio and images samples” post and comments section. MINI MX could transfer a 278MB file @ 1.5MB/s on average between the flash and a network share (SAMBA), which makes the device only of the worst performer. Gigabit Ethernet, tested with a large file, was much better in both direction (flash to SAMBA, and SAMBA to flash) with an average transfer rate of 15.7 MB/s, one of the best in all devices I’ve tested. However since with Gigabit Ethernet, this test is also impacted by the internal storage read and write speeds, it’s always good to test raw performance with iperf. I’m using a full duplex transfer for 1 minutes with the command line “iperf -t 60 -c server_ip -d“. But most of the time, it seems to kill Ethernet connectivity, so the test would not complete, and I was unable to browse the web anymore. So I rebooted, and it went a little further but full duplex is not handled very well with an excellent 894 Mbit/sec in one direction, but only 16 Mbit/sec in the other. There’s again a problem with the timings showing 2204.7 seconds instead of 60 seconds. Contrary to Videostrong KI Plus, Beelink MINI MX does support Bluetooth, and it worked pretty well, as I could transfer photos over Bluetooth with my smartphone, listen to YouTube music videos via a Bluetooth headset, and pair No.1 D3 smart watch with the device. Since the firmware is rooted, I could also successfully use a PS3 Bluetooth game controller with Sixaxis. The same “10 MB free space bug” found in Amlogic Android Lollipop SDK also occurred here with the NTFS & exFAT partitions on my USB hard drive. My FAT32 micro SD card could be mounted fine, and I got access to all the space..
That means I had to skip USB storage benchmarks, and only ran A1 SD bench app on the internal. with the app reporting 27.62MB/s read speed and 15.95 MB/s write speed. 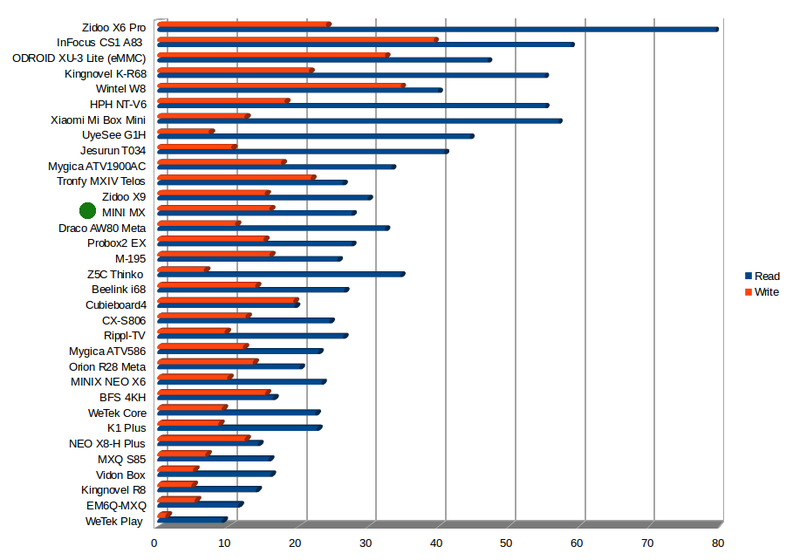 A pretty decent results for a low cost TV box. Somehow Beach Buggy Racing was much better, even with the graphics quality set to the maximum “high resolution”. It played quite smoothly, but with some very short freezes (<0.5 second) from time to time. Riptide GP2 was also interesting, and while it was very playable with default settings, it would just exit/crash when I tried to set the quality settings to the maximum, 100% reproducible. So I set it to one bar less, and the game could run for a while, before exiting as I tried to play… So I went back to default setting and I could play 4 to 5 races for about 15 minutes. When I exited the app manually, it took 8 to 9 seconds to go back to the launcher. 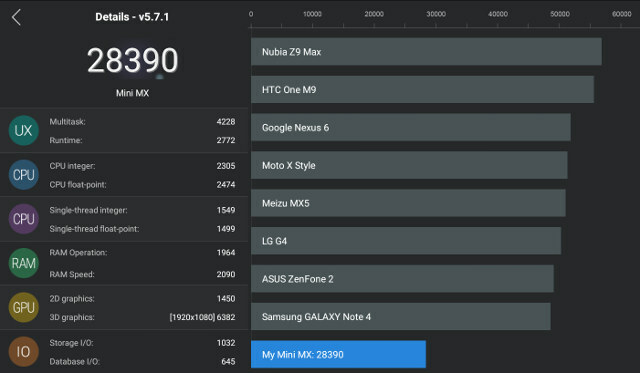 CPU-Z still detects a quad core Cortex A53 processor @ up to 2.02 GHz with a Mali-450MP GPU, with the board being called “p200”. 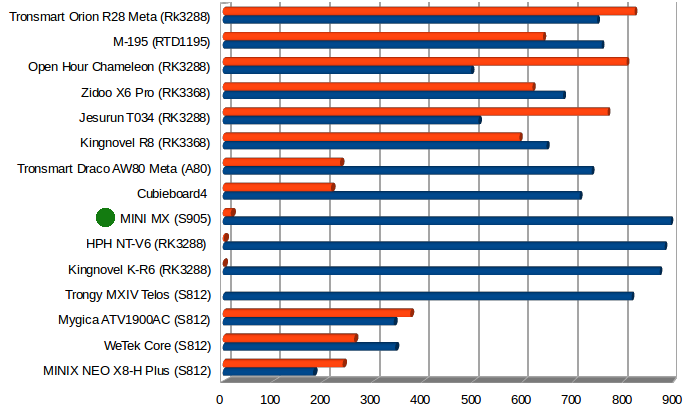 The Antutu 5.7.1 score was 28,390 points or about the same as K1 Plus. While the firmware is mostly stable, I did experience some slow downs that didn’t seem related to a slow flash, and games were somewhat unstable for some reasons. This review also confirmed that Kodi 15 nor 16 is ready for Amlogic S905, but that does not stop manufacturer from pre-loading their half-baked version, so I had to test video with MX Player, which was much better, and similar to K1 Plus. Gigabit Ethernet performance was pretty good, but somehow it did not help with videos played from the network, while WiFi performance was very poor. 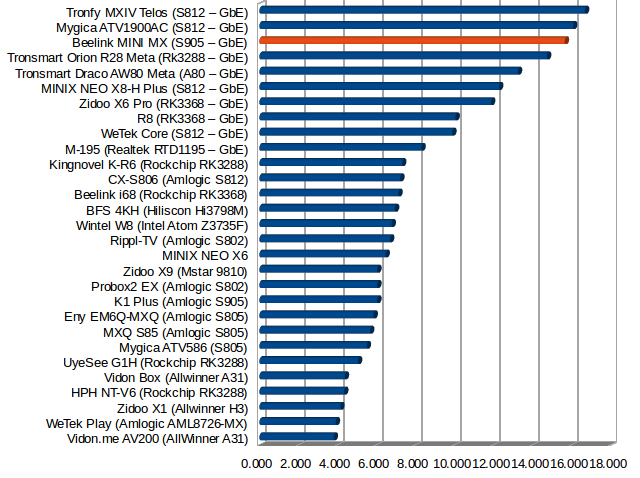 So while MINI MX has potential, Beelink/Netxeon still have some work to do to make it a usable device. OTA firmware update is working. The firmware experiences slowdowns at times, and it may take 5 to 9 seconds to go back to the launcher after exiting an app. HDMI – Dolby Digital 7.1+, TrueHD / Atmos, DTS HD audio pass-through not working; CEC not working; Video output resolution set in settings is not always used at next power on. 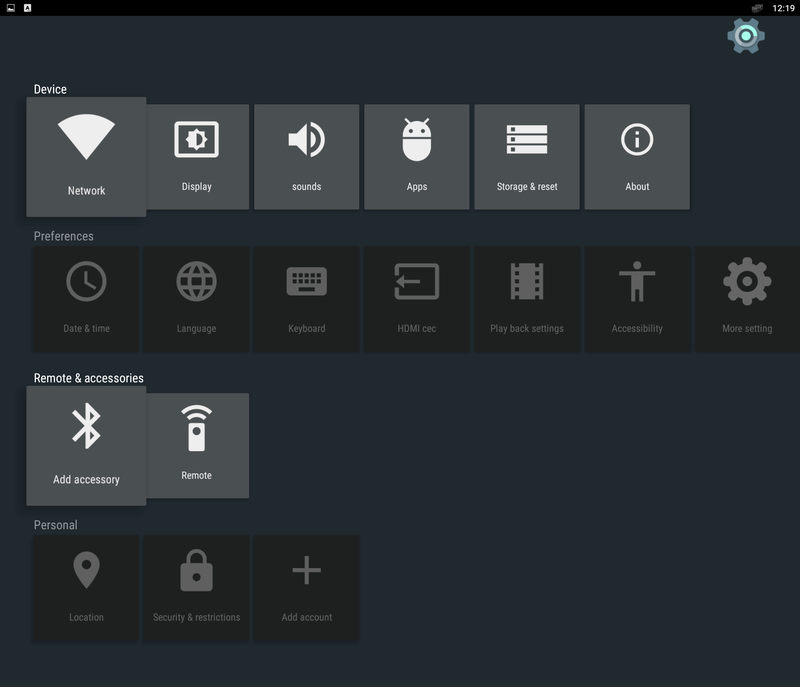 Both Beelink MINI MX and Videostrong K1 Plus have issues, many of them overlap in both devices as their firmware is based on the same Amlogic SDK, and the products are been rushed to market. I can’t really recommend any device right now, but working OTA firmware updates for MINI MX does bring some peace of mind. You’d also have to consider whether you need Gigabit Ethernet and Bluetooth (lacking on K1 Plus, but present on MINI MX), or AV output and more USB ports as found on K1 Plus. I understand two issues – DRM and DTS & Dolby support – can’t be fixed with firmware upgrades, so I’d wait if you need either or both. I’d like to thanks GearBest again for providing Beelink MINI MX sample for review. If you’d like to go ahead and purchase the device, you could do from their shop for $40.89 including shipping. You can also find the TV box on some other e-retailed such as GeekBuying ($44.99), eBay, Amazon US ($55), and others. Would you mind testing latest kodi nightlies on this (and future/past S905), please. I’ve merged a bunch of aml fixes. I’ve got a Mini MX sample from Beelink factory and have been talking with them about a lot of these issues. 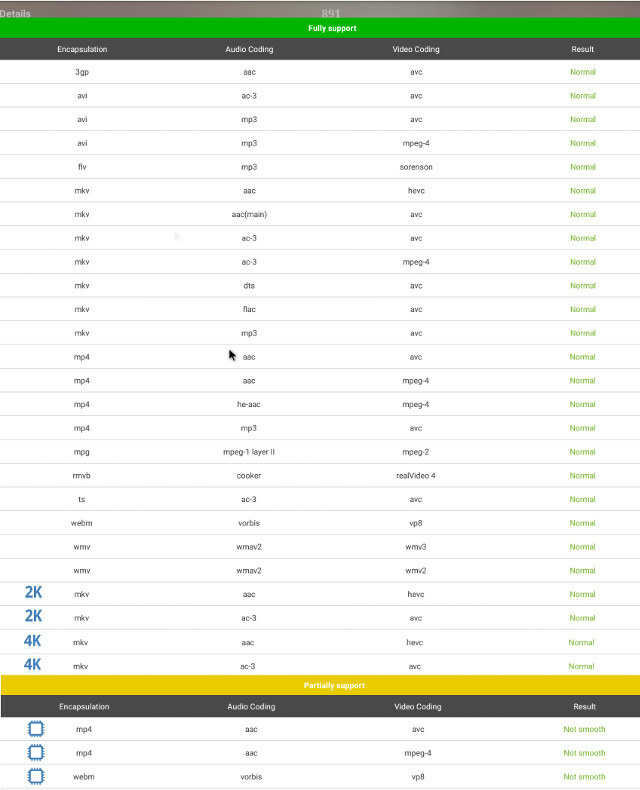 As for 103l1 it should fix the storage misreporting – have asked beelink for a list of other change notes. There are some issues with Wifi for which they are talking to their design team about – may need hardware changes. HDMI-CEC does work perfectly on my LG TV – So something specific to your setup not working. I removed their KODI and am running a 16 nightly build, after fixing AML video dev permissions it plays fine with the amlogic codecs – however auto frame rate switching is not working, but if switched manually on the mini mx it plays fine. I was able to play quite high bitrate videos (50+mbps) with DTS audio over samba via ethernet without issue. DTS passthrough from Kodi is also working for me. (Unable to test DTS HD/Atmos/etc as my amp is too old) but do experience very occasional brief dropouts only on passthrough. Thank you for your honest and detailed reviews. My main source of news for this technology the past years. Keep up the good work! As for the S905 boxes I have high hopes that software will mature and it becomes a cheap and stable 4K platform. so glad to see and read your review, I’m waiting for mine to arrive still but am concerned, due to no widevine am I correct in thinking netflix won’t work!?! this is big problem for me if so… is it easy fix in update for them if thats the case?! I stupidly ordered this box at a point not knowing it was so new.. then learning about it all & drm, maybe I should have ordered something with an older processor… hmm..
Why do the S905 (or for that matter all AML based boxes) don’t allow Dolby/DTS HD formats (X or Atmos)? is it a license issue? is it solvable in software? S905 is capable of HD audio passthrough, so it’s a firmware thing. A very imprtant thing to consider when buying one of the bazillion AML device on the market is the support history from the vendor. I’ve tried factory reset but its still not working. Maybe you’ll need to do a USB update. I can’t find the firmware for download yet. Or maybe ask your seller for a link to the original firmware in order to reinstall it. I think it’s my own fault. I edited the build.prop and digging around in the zip file the update script checks the hash of all the files. I removed the build.prop check and secure check completes but because its a modified zip it fails. I’m quite busy with hardware reviews right now. So I won’t try on MINI MX. But I might try on other Amlogic S905 devices which I should review soon. I’ve been told that for DRM, something needs to be done at the factory, so once the product ships it can’t be changed. I’m pretty sure that’s true for Widewine L1 (used for Full HD and 4K streaming), but I’m not quite sure about L3 (up to 720p). I have not tried Netflix here (it’s a pain to set it up), but it’s likely it won’t work. 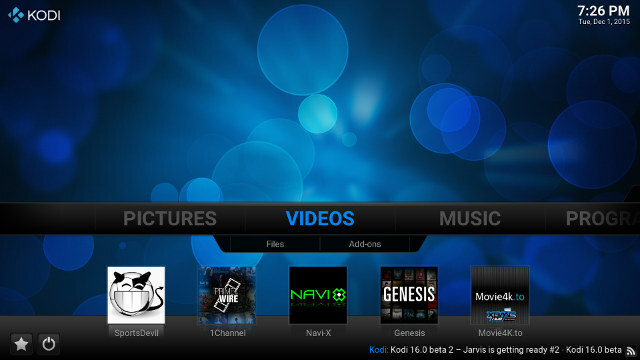 Kodi goes around the Dolby/DTS licenses, so it’s a firmware issue. For most other apps, it’s a license issue. and see if the firmware update can go through. Thank you so much. I will try and edit my original build.prop first I think I see what I changed. I’ve got 103l1 for the mini mx in the usb burning tool format if needed. I would really appreciate the files just in case I can’t get this working. Man this box is really messed up, can’t even load play store now to install root and build prop editor. Whatever you do DO NOT mess with any system files or you will end up in a world of pain. I ordered that box without knowing the issues it have. some will be fixed by firmwware update but sadly some need hardware change or factory fix. But what i learned form that is to never hurry to buy new thinks. i will wait for review before to decide. Yeah I’m stuck now I cant load Play Store even if I delete cache, it just loads and crashes instantly. Tried uninstalling updates and it just crashes when I click install on an app. I would really appreciate the usb burn tool files Whiterat. My comment is “awaiting moderation” presumably because it has a link in it…. Thanks but it’s asking for a decryption key. Thank you so much, been trying to sort this for 4-5 hours now. Good detailed review. Have the S905 myself, decent box but I would concur it has iffy game performance with the Mali 450. Just 1Gb ram doesn’t help either so I wouldn’t expect any miracles in this department. I had issues with supplied Kodi 15.2, streaming among others but since installing the firmware upgrade & Kodi 16 these have been ironed out and now working. Be patient on the restart after firmware upgrade it does stick on that Mini Mx logo for a while. I would say Beelink were eager to get it to market early and let the early adopters face some bugs (like many other Android boxes), but I’ve seen very positive improvements since the new firmware install so happy here. Does the Mini MX even have an OTG port because I’ve tried both USB ports and it’s not showing up at all. Language switching is known issue (at least for me) even on m8 devices. Happens only on LG afaik and it switches to Korean, not Chineese. Happens when auto switch language on box is enabled. Yeah, USB-A on the side is for OTG – Flashed mine with it ok.
Ah sorry my mistake – That’d make sense. On these boxes the auto language switch is enabled by default and you cannot disable until you’ve enabled cec and the language has already changed at that point. Just tried latest nightly on 103l1 and still about the same as my first post (which is pretty good). Aml codecs in use, passthrough still working (albeit with intermittent drop outs) and no auto framerate switching. Changing digital_raw makes no difference to the dropouts. is it possible to unpack the .img file in windows? I tried everything last night and I couldn’t get it showing up, had another go this morning and it flashed first time! Just click on the double down arrows in the status bar. I think both the status and notification bars will be hidden. All I see is a black bar along the top with ethernet icon and time, if i drag it down it is the standard lollipop notification tray. You could not send the link to the firmware as well as the program for the firmware and write as you flashed the device ? Actually I don’t see the notifications bar, only the status bar. If you look at start of the video @ https://www.youtube.com/watch?v=6wRO4NF7phg, you can see the status bar at the bottom, and the icon just on the right of the power icon and on the left of the back button. I flashed the full firmware linked above and I don’t see the status bar only the notifications bar. I have wiped and erased I don’t know how many times. With aml tools no, unless you do some reverse engineering with usb burning tool. Binary that pack/unpack .img file is part of amlogic sdk and runs only on Linux machines. Does not include source code. Also bought this beelink mini MX from Gearbest thinking the S905 would be the answer to 4K goodness. Really disappointed so far. First of all, trying to use a remote without a keyboard is impossible. It also did not work with my Bluetooth keyboard which works fine with Nexus 5, Hudl2. It did pair it OK, but nothing after that. I tried big buck bunny, 4K, 60fps and it was mostly unwatchable. Glitchy dropped frames. Audio ahead. Pointless. Kodi 16 was dead when clicking on video add ons. Not tried the nightly builds yet. I tried a Philips UHD demo. Which seemed better. Initially, I tried both on a micro SD card and both the Philips UHD demo and BB Bunny were unplayable from a SDXC 80 Mbps card. Switching to a USB 2.0, only the Philips UHD Demo file was acceptable. Not as perfect as the 4K TV directly, but acceptable. I wonder if anyone has tried a better rated HDMI cable suitable for 4K? Possibly the HDMI cable is also a piece of junk for 4K? Also the two other issues. 1GB ram feels like a huge bottleneck. And the WIFI is awful. Only, 2.4GHz network and doesn’t even connect to my router, when every other device is fine. On the plus side…I am sure it will play 1080p fine…but not what I bought this for. I guess I will have to pay twice and go for the Nvidia Shield TV. Are there any other suggestions that can compete with the Shield, because this was a painful lesson of pay cheap, get junk! Do Gearbest do refunds? @Whiterat ). Video Player and MX Player handle video pretty well, again as long as you have an AV receiver, and don’t need DTS / Dolby down-mixing. Forgot to mention, YouTube app has a hard limit of 1080p? Anyone know why? VP9 codec issue? How do I even get a VP9 codec on Android or get the YouTube app in 4K? I managed to use browser as desktop and YouTube desktop site to pick 4K. But super glitchy and won’t go full screen. In theory you might be able to software decode VP9 (https://www.youtube.com/watch?v=D-FudbJhRlA), but it will be super slow and basically unwatchable, if it even works. For the wifi performance, we have optimized it in the mass production batch..
Other bugs,we’ll fix them step by step by OTA. What does mass production batch mean? How can we identify if we have a box from mass production. I bought it from Gearbest. Mass production means production of large amounts of same devices. Production of samples (small amounts) for existing and potential customers is another thing. If you bought your product from online store it came from MP batch for sure. HDMI-CEC works fine between the receiver and my LG TV however, and I can use the AV receiver remote control to control both the TV and receier, and in theory, I could control inputs too, but I’ve never been able to make it work with any device. But nothing with 5-digit. I can’t find anything in the CEC specs @ https://xtreamerdev.googlecode.com/files/CEC_Specs.pdf with regards to that 5-digit code either. Would you know what that 5-digit CEC code might be for your box? You said : [For the wifi performance, we have optimized it in the mass production batch..]. if that mean that the box’s that you will produce will have a modification to optimize wifi. Question : what will be the solution for the people who bought a box on presale (for example Gearbest) ? For DTS and DRM : will you offer an online service (a paid update) that will add DRM and DTS on SDK ? For at least M8 devices you can try code 10362. This is vendor(0x1b8e)+device(0x0cec) converted to decimal. Thats only combination that gives me 5 digit code from cec driver of m8 kernel and it’s hardcoded. Thanks. But no luck, and I have still the same “This remote device does not support CEC” message in my box, after typing the code in the AV receiver. I also tried “07054” (=0x1b8e), but no luck..
Could you please tell us starting from what serial number or other code of the box is the wifi better?